Inspired by turn-of-the-century English garden designs, the LEAGRAVE concrete bench collection features a distinctive Arts & Crafts motif. This is a nod to the classicism that has made many a culture envious of the gardens fanning around Great Britain’s country houses and the benches that grace those gardens. This is the smaller version of the LEAGRAVE BENCH collection. It is sturdier than its teak counterparts, as it is made of concrete. Beautifully substantial and outdoor friendly, the portland finish gives the bench its patina that will only improve with age. This makes the Leagrave Jr. bench as timeless in style as its predecessors. The generous size seats 2 guests comfortably. Because of its weight, this is one of the "go to" benches to consider for theft prone locations. We find that the cement base to this bench is far more durable than the teak versions you may find at retailers such as Restoration Hardware. Without the need to clean and oil the teak annually this bench will gain character annually when exposed to the elements. This bench weathers to a vintage patina, complete with slight cracking in its finish which is to be expected and part of its character. Naturally occurring hairline cracks in the concrete along with color variations are natural to this product and do not impact the structural integrity of the bench. This item ships for $99 per bench to a location capable of receiving commercial crated shipments. 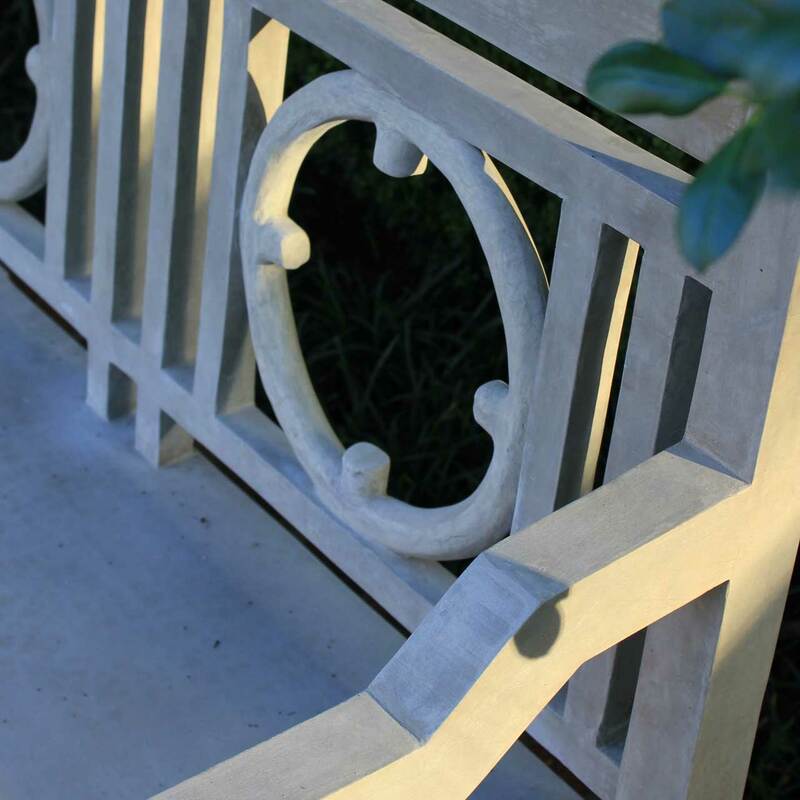 This bench weathers to a vintage patina, complete with slight cracking in its finish which is to be expected. Naturally Occurring Hairline Cracks in the Concrete and Color Variations are Natural and Do Not Impact the Structural Integrity of the Product.